It's a micro challenge at Caardvarks! 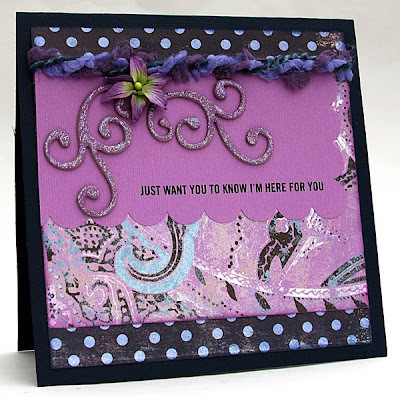 Make up a lovely card in shades of purple and link back to the Purple Snurple challenge by midnight April 1st for a chance to win a gift certificate from Itty Bitty Scrap Shack. 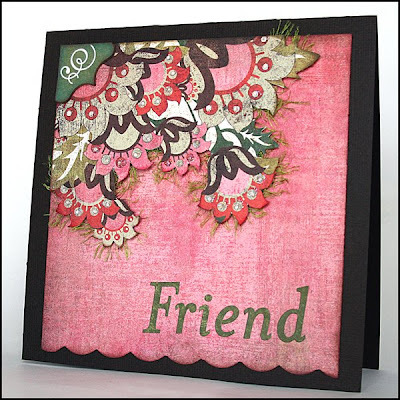 I made this card using a Cuttlebug embossing folder and some WorldWin DoubleMates cardstock. Details can be found here. This second card was pulled together at the last minute, but I love everything about it. 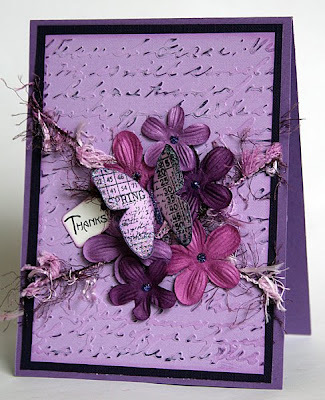 I enjoyed using navy blue with shades of purple this time. Details can be found here. So go dig up some purple stuff in your stash and head over to 'Varks. See you there! My laundry woes continue. I am still without a working washer and dryer. They were delivered today but without adequate hoses. So several hours of phone calls later I am on a waiting list for delivery and service...AGAIN. Anybody want to do my laundry? 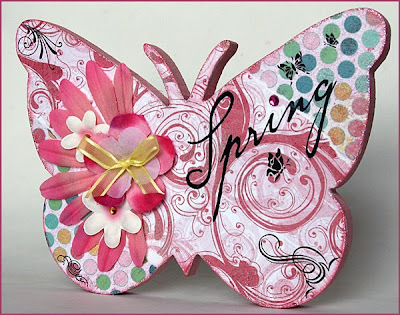 The good news today came from Dawn Gehring at Crafts 'n Things magazine. She wants to publish my two very favorite Christmas cards in their December 2008 issue. Yay! Caardvarks released its newest challenge today called Homegrown. 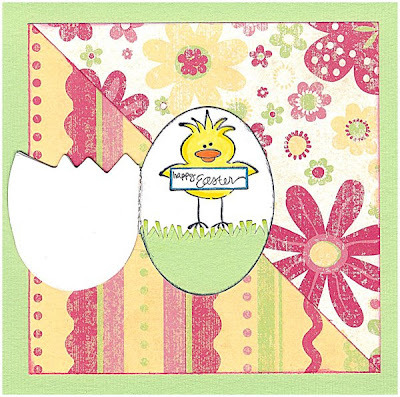 Link your cards featuring fruits or veggies to the 'Varks site by March 31st at midnight to be considered for a kit from Itty Bitty Scrap Shack. 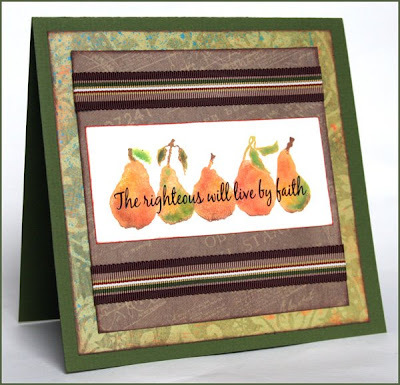 I made this card by inking a pears stamp with about six colors of Colorbox chalk inks. Once the image was stamped I added more shading with chalks. I love how it turned out! Check out all the cards in the Homegrown gallery. Updated: The stamp is a row of pears by A Stamp in the Hand Co. The verse is a rub on by Colorbok (purchased at JoAnn Fabrics craft store). Caardvarks is also selling kits! The debut kit called Rainbow Sherbet is available from Itty Bitty Scrap Shack. Caardvarks kits will be revealed on the 20th of each month, so keep watching for new and exciting collections of goodies. There will also be challenges using the kits! Peekaboo! Here's my take on Di Hickman's card sketch for this week. When I first saw the sketch I wasn't sure what to make. Then I remembered the egg die I had and went to town. Details can be found here. My friend Lauren will be pleased to see that my unnatural love of projects with small furry animals continues. This one's for you, Chickie...pun intended! It's official...I'm in fuzzy, fiber heaven! Basic Grey is holding a contest for projects featuring their fibers, and I am all too happy to lend a hand. I have made these three cards so far and have a layout started. I am expecting some new fibers in the mail from my dear friend Carolyn, so next week I hope to make a few projects with fibers in new and exciting colors. I made this card for my parents' wedding anniversary next week. I love you, Mom and Dad! 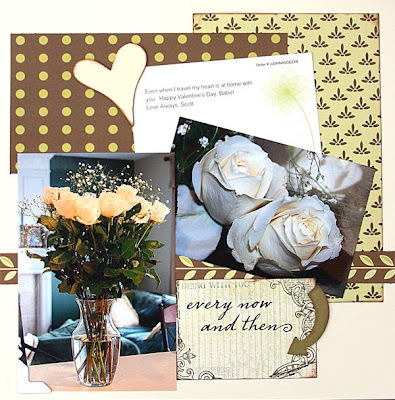 It's WAT at Scrapbooker Online, so here's my DT project for the week using supplies from our sponsor One Heart One Mind. I was absolutely floored with surprise when Scott sent me my favorite roses on Valentine's Day (while he was working in Puerto Rico), and I wanted to scrap the note that came with them to let him know how much his thoughtfulness means to me. Details for this layout can be found here. I Did NOT Fall Off the Earth. Period. Ever since I started a blog I have been pretty good about keeping it updated. But over the weekend I had the wonderful opportunity to escape from my daily chores with some friends. We spent the weekend in our jammies in a lake house scrapping, eating and laughing. It was so much fun! I made lots of great projects, but most of them are for various DT reveals. So you'll just have to wait! 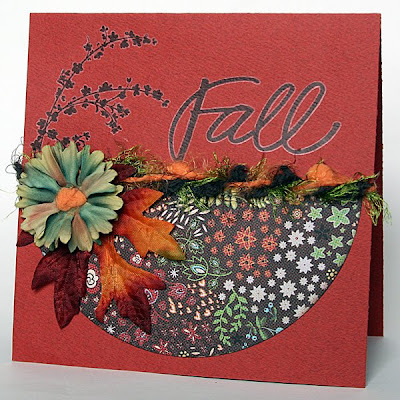 This card uses Di Hickman's sketch for this week. Details can be found here. Ok, I admit it, I'm in some kind of stange baby spring animal phase! 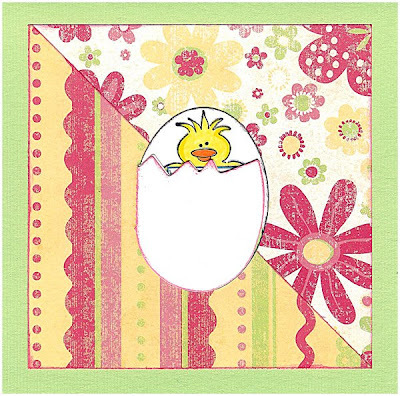 With Easter just around the corner I can't get enough of little chicks and bunnies. You'll be seeing them pop up on my projects in the next few weeks, so be warned! 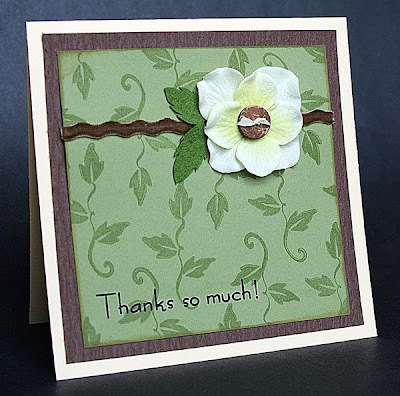 This card is for Di Hickman's sketch release today. Details and supplies can be found here. It's also a new challenge day at Caardvarks! 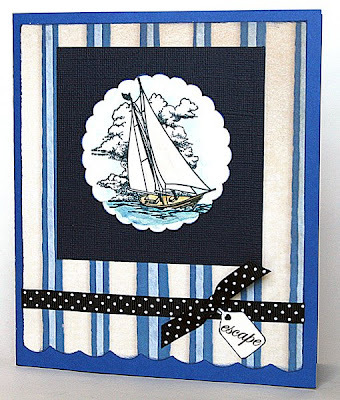 Try our new Caard Trip challenge and make cards with a transportation theme. Link them up to the 'Varks site by March 18th at midnight to be eligible to win this set of adorable stamps by Kim Hughes at Cornish Heritage Farms. WHOOO can resist them? View the details for this card here. 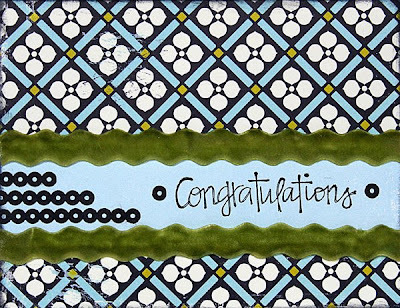 I finally had a project accepted by the Scrapbook Trends editors. 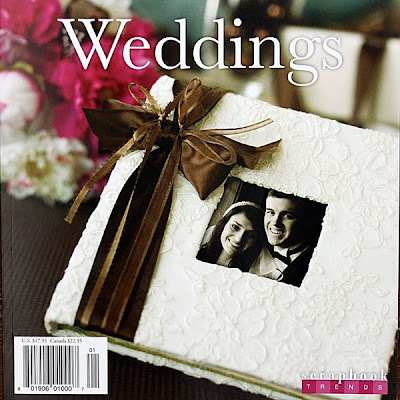 Their Wedding Idea book hit the newsstand early in January, and I was so happy to see it! I had this card accepted for the book. The funny backstory for this card brings a little panic to my heart. 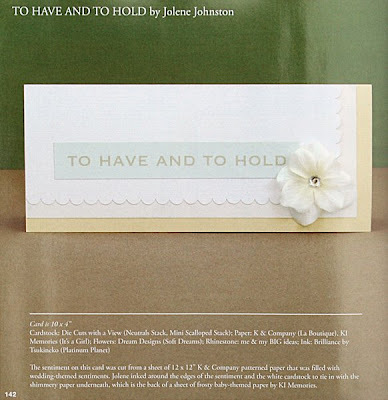 I made this card and neatly tucked it away like many of the cards I submit to magazines. When I got the callback for the book, I went to get it. For some strange reason there was a brown spot right on the paper with the sentiment...and the card was ruined! So I began the hunt to replace that paper and remake the card. (Little did I know that the paper was an older line and VERY hard to find!) Several desperate trips to local craft stores and a few gray hairs later I found the exact sheet of paper and was able to replace it on the card in time to mail it for publication. Whew! Our altered challenge for March is up at (Some) Assembly Required. Alter a letter or shape and link it up to the comments section at SAR to be eligible to win a prize pack including two awesome shapes from the Say It With Letters online store. Big thanks to Deb Damboise for sponsoring us for this challenge! 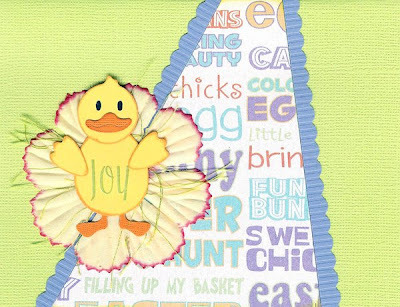 Well, after one month of Design Team work at Scrapbooker Online using cardstock only from WorldWin paper company, I needed to squeak out one more design with no patterned paper. 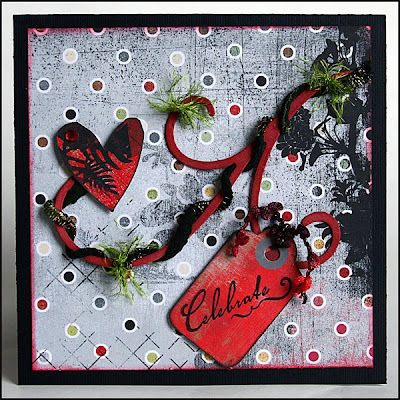 This card is for the new Caardvarks Micro Challenge to create a card using cardstock only. Make sure to link up your card to the 'Varks site by midnight EST tonight! And stop by SBO's 3rd Anniversary Crop for challenges, games and lots of prizes. During our chat last night owner Maryfrances handed out several yummy gifts! Way to go, big sis.